Holy smokes, August is almost here! Let's enjoy a beach escape while it's still Summer. Reserve Friday August 12 through Sunday the 14th for fun time. I'll be staying at the inexpensive Best Western Paradise Inn this trip, which is about half way between North Padre Island and Downtown Corpus Christi. If you have not windsurfed before, you'll want to schedule classes at Worldwinds. 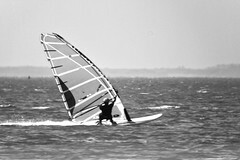 Almost all of my surfing friends have learned how to windsurf from the fine folks there, including myself. Just be sure to show up to your class early -- late is rude. To get started, look at the 5 easy step to Windsurfing Bliss. What a best blog. I never seen such kind in my life.